Gather all required parts and tools. Scan the installation instructions to preview the requirements and what you will be expected to do. Rachio recommends professional installation; however, we provide installation instructions for handy people with DIY skills. Rachio recommends specific installation instructions based on your pipe size and material. Using any installation methods other than those recommended could damage the Wireless Flow Meter or void the warranty. Using glue of any kind will damage the flow meter. While installation times average 30 minutes, we recommend allowing 2 hours for completion. If you cannot complete any of the steps, we recommend a professional installation. Need a professional? To find a Rachio Pro, go here. Installation site must be within 300 feet of an installed and setup Rachio 3 Smart Sprinkler Controller. Backflow preventer and installation area must be above ground (recommended). The flow meter is not rated for potable water and must be installed after the backflow preventer. System must have ¾-inch or 1-inch pipe made of either copper, PVC, or PEX. For 1-inch PVC pipe, or 1-inch copper pipe, and ¾-inch PVC pipe, you will need 14 inches of straight pipe between the backflow preventer and valve box. For ¾-inch copper pipe, you will need 16 inches of straight pipe between the backflow preventer and valve box. If you have more than one Rachio 3 controller, more than one backflow preventer, or a pump, visit rachio.com/flow-advanced. The following Rachio Wireless Flow Meter installation instructions are intended only for irrigation systems with 1 inch copper pipe. If your system uses a different pipe size and/or material, please visit rachio.com/flow for instructions tailored for your system. Installation instructions are intended only for use with required fittings. Sharkbite brand, SKU # UIP4020. Available at Home Depot, Lowe’s, Supply House, and Amazon. For copper pipe: 1 in. Copper Tubing Cutter. Do not use a hacksaw or PVC ratcheting pipe cutter. Available at Home Depot and Amazon. Using installation methods other than those recommended in this manual could damage the Wireless Flow Meter or void the warranty. Inserting your fingers into the Flow Meter or fittings can damage equipment or cause personal injury. Once attached, fittings cannot be removed from the Flow Meter, but may be removed from the pipe using fitting removers. Using glue of any kind could damage the Rachio Flow Meter. If you’re unable to complete any of the installation steps, we recommend a professional installation. To find a Rachio Pro, go here. Are you a visual learner? Preview the installation method in our video! These instructions are specific to 1-inch copper pipe installations. Don't miss a step! For a successful installation, review and follow all instructions carefully before installing your Wireless Flow Meter. Take the Wireless Flow Meter to the backflow preventer where it will be installed. Do not put the batteries in the Wireless Flow Meter until prompted. Open the Rachio app. From the "More" tab, select "Accessories," then add the Rachio Wireless Flow Meter. You will be guided through the pairing process and then prompted to continue installation using this digital manual. Turn off water to the irrigation system at the backflow or at the main shut-off. Drain the system by running any two zones for one minute each using the Quick Run feature in the Rachio App. Push the Flow Meter and fittings together firmly using a twisting action until the fitting (part #UIP4020) is nearly flush with the Flow Meter. One part #UIP4020 should be attached to each side of the flow meter. Identify 14 inches of continuous straight pipe between the backflow preventer and the valve box. Mark 6 inches after the start of continuous pipe (this is often after a joint); this will be the top cut. Mark 6 ¼ inches after the first mark; this will be the bottom cut. Put a small X next to the first two marks. Mark 1 ⅛ inches above the top mark to indicate insertion depth. Mark 1 ⅛ inches below the bottom mark to indicate insertion depth. Accuracy is important here! Measure twice, cut once. Make a clean, straight cut on the two innermost marks (denoted with X’s). First, cut the top innermost mark. Next, cut the bottom innermost mark. Do not cut the pipe on the outer insertion marks. Use the deburring tool or sandpaper to remove rough edges and debris inside and outside the pipe. Push the flow meter, fittings, and pipe together firmly while twisting the fittings to the insertion marks. All Rachio recommended fittings swivel 360˚, allowing for easy directional adjustment of the flow meter after installation. Turn the water back on. Check installation site for leaks. If there is a leak, turn the water off and make sure the fittings are pushed up to the body of the flow meter and insertion marks. If the leak cannot be remedied, visit rachio.com/leak. 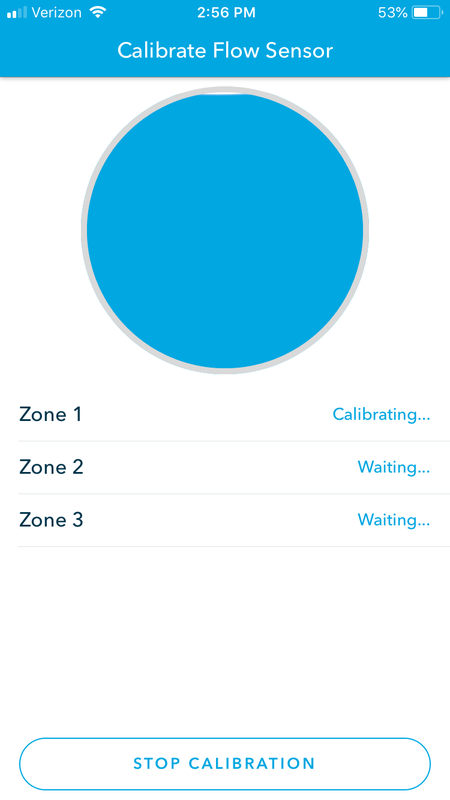 To enable real-time leak detection, you must calibrate the Rachio Wireless Flow Meter. In the app’s "More" tab, select "Accessories," then select the Rachio Wireless Flow Meter. Follow the app instructions to calibrate. Check your email for tips on monitoring water flow and leak detection with your Rachio Wireless Flow Meter. Your flow meter is now reporting actual water usage and monitoring for leaks. Want to explore Wireless Flow Meter notifications and what they mean? Check out this article for more information!